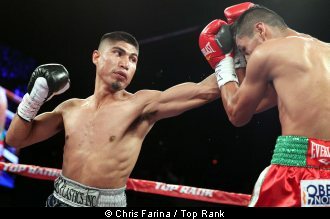 Mikey Garcia decisions Juan Carlos Burgos in New York. Is Yuriorkis Gamboa next? New York -- Miguel Angel “Mikey” Garcia continued his winning ways in his return trip to The Big Apple against a tough-on-paper opponent in Juan Carlos Burgos. Garcia now 34-0 with 28 KO, scored a methodical Unanimous Decision victory against a mobile and competent Burgos at the sold-out Theatre of Madison Square Garden in Midtown. Garcia, 26, of Oxnard, California utilized effective jabbing against his Mexican opponent who was at times effective in countering Garcia’s aggression. But that did not deter Garcia who pressed the action most of the night as he tried to impress the discerning New York crowd with a spectacular win via knockout. That knockout or knockdown did not come for Garcia, who was instead almost sent to the canvas early in the 2nd with a left hook counter from Burgos. That was all Burgos can come up with as Garcia retained his WBO Junior Lightweight belt with a commanding performance from the 4th round onwards with scores of 118-110, 118-110 and 119-109. Garcia’s rumored next opponent, unbeaten Yuriorkis Gamboa kept a close watch on his performance at ringside and even climbed the ring with his promoter and music mogul, 50 Cent (Curtis Jackson in real life) to try to provoke Garcia in fighting him next. Both Garcia and Gamboa have been exchanging heated words via social media and a fight between the two talented fighters will sure be a fight to watch for in the future.